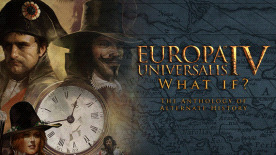 Stories in the Era of Europa Universalis IV This is the ultimate collection of short stories set in a history that never was, inspired by the critically acclaimed Europa Universalis IV computer game by Paradox Development Studio. The Master of Alternate History himself, mister Harry Turtledove, is joined by twelve other writers, each of them creating their own history of what might have been. The point of divergence of every story in this volume is set in the age of Europa Universalis: 1444 to 1821. Three of these stories are the winning entries in the Paradox Short Story Contest 2014. Authors: Harry Turtledove, Janice Gable Bashman, Lee Battersby, Luke Bean, Raymond Benson, Felix Cook, Aidan Darnell Hailes, Jordan Ellinger, James Erwin, Anders Fager, David Parish-Whittaker, Rod Rees, Aaron Rosenberg. To access your ebook, navigate to the ebook folder in your Europa Universalis IV game folder. Upon purchase, this book will be downloaded to the Steam folder on your computer in three formats: epub, mobi and PDF. To read the book on your mobile device, transfer the epub or mobi file to the device and open the file in your ebook reader app. Enjoy! Europa Universalis IV is required to play this DLC.